I love movies. Always have. And every great movie, whether it’s a big Hollywood production or an indie cult classic starts with a great screenplay. The script is what attracts talent and investment, inspires genius, and ultimately just tells a great story worth watching. And there’s a formula to storytelling that makes great movies great. A formula that never fails to rise to the challenge because it educates and entertains by grasping at the very roots of the human condition. That formula is classical mythological story structure. And it’s allowed stories like Homer’s Odyssey to persevere for literally thousands of years. And you can play with the formula quite a bit. After all, it’s just a framework. But there are some key ingredients you have to have to make a great screenplay. No matter what the genre, you’ll find that the best movies have these things. And the worst, don’t. I’ve been doing a lot of drawing lately – gearing up for an amateur painting contest with some friends. And this is all on the lo-fi, and by that I mean on canvas, not photoshop. 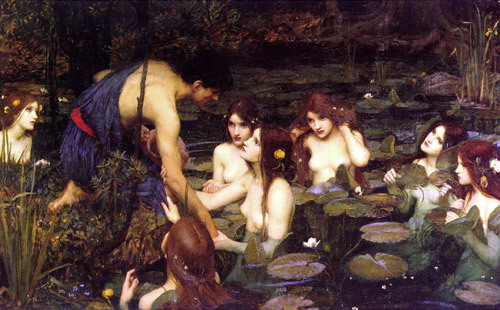 Anyway, I’ve also been studying some of history’s great masters to get some ideas on style and technique and I came across J W Waterhouse’s Hylas and the Nymphs. And my first thought was … ‘Man, that’s good marketing’! It can be change for the better, or for the worse. But that change usually becomes the new focus. It’s either “Oh wow, we have all these orders to fill” or it’s “Oh no, things aren’t going as planned. We have to make some cuts”. 1. Build your brand. Things are going great. You’ve got more business than you can handle so there’s no use wasting money on marketing right? Wrong. This is the time to build your brand. When you build your brand you get customers coming to you. They’re coming to you because they know you and trust your brand. And when people are coming to you; when they want what you have, it’s a lot easier to charge more and increase your margins. The very nature of being an entrepreneur means you’re taking a bit of a shot in the dark with your business idea. You’re blazing a new trail. Going where (hopefully) no one else has gone before. But you can make your startup a whole lot easier by following someone else’s trail in the beginning. In the end, it’s that new territory that you discover and conquer that will make you the king in your industry. But you’ve got to start somewhere, and the best place to start is to follow the current kings around and learn from them. No matter what you’re selling; products, services, affiliate marketing … there are already people and companies out there making an absolute killing in the market. Some of them spend millions of dollars develping packaging that sells, ad copy that stops you in your tracks, and websites that convert into sales.